Encap, the makers of the Fast Acting Lime which got a positive review from me a few years ago (because it helped green up my white grass! ), is running 2 sweepstakes this year including 3 lawn makeovers and daily 3-in-1 Soil Meter giveaways. A couple other giveaways have already ended. Every day starting from June 1st through September this year one lucky winner will receive this 3-in-1 Soil Tester which measures soil moisture, soil pH and light. Entering is easy and there's no purchase necessary. Just find one of their products, scan the QR code with your phone, like them on Facebook and you're in! More details can be found here. I have one of these and when I first got it I immediately opened it up stuck it in the soil (requires no batteries) switched it to pH and the needle didn't move. 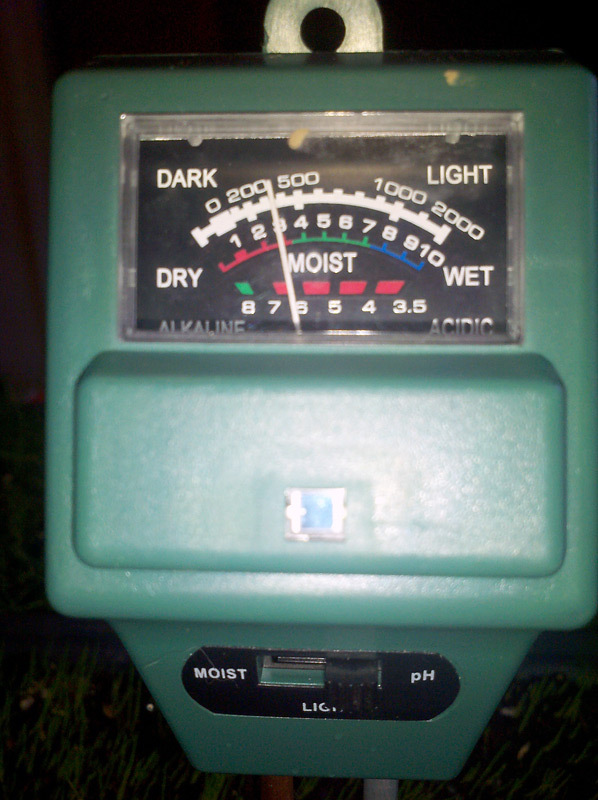 Turned it to moist and the needle moved a little but showed the moisture level was very low. The light seemed to work fine. I was on my way to my uncle's place and took it with me. Checked his soil for moisture and the needle shot up to wet. Not a surprise he has an irrigation system and waters his lawn frequently. Clicked the switch to pH and saw the needle move as well. Aha! Soil must be moist to get a good pH reading! When I got home I stuck the probes in my soil, watered the area and finally was able to get a pH reading but was it accurate? I have the Luster Leaf 1612 Rapitest pH Soil Tester that you pour soil into, pour the contents of a capsule, add water, shake and wait and tested the soil in a couple of spots using both the 3-in1 Soil Tester and the capsule tester. The readings were similar (these aren't exact digital readouts) but the 3-in-1 Soil Tester was much faster and easier to use. No digging up soil, fitting it in a little hole, messing with capsules, water and no wait! With one being given away each day there are plenty of chances to win. Is your lawn so bad you think it needs a makeover? If so submit a photo of your troubled lawn to Encap's 2012 Lawn Makeover Contest, get your friends and family to vote for your lawn as the most troubled lawn and you might win one of 3 lawn makeover packages which include a variety of Encap lawn products as well as a $100 Home Depot gift certificate.